It might be a one-joke movie, but it carries that joke out in all different ways and to absolute perfection, over and over again. 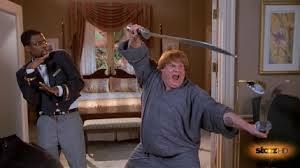 Beverly Hills Ninja is a great Chris Farley movie. It’s plot about how this fat white guy was raised by ninjas in Japan and has no skill or ability whatsoever, is pretty funny. It’s also pretty simple, and that’s why it works. The jokes are all Chris Farley crashing through things or destroying objects, or making people uncomfortable. And nobody does it better. The premise has Farley’s character, Haru, stay behind at the ninja dojo one night while his father and brothers go out to fight. They don’t trust him to go with them and for obvious reasons. We see before this how during Haru’s training he screws everything up, often at the expense of the others. One in particular, Gobei (played by Mortal Kombat’s Robin Shou), is constantly getting hit by Haru by mistake. Every time Haru tries to thrust his bow stick through the air, he ends up breaking it over Gobei’s back. This kind of stuff is very funny, not just because of the bow stick breaking, but because of Gobei’s angry reactions afterwards. Haru stays back that evening to watch the temple, and a hot blonde seductress (Nicolette Sheridan), comes to see him. She’s looking for help. Apparently she doesn’t trust the man she’s with and thinks he’s up to no good. Instead of just being a simple announce the mission scene, however, this movie treats it as an opportunity for Haru to show off his skills, or lack thereof. He shatters the ashes of fallen warriors, sets an ancient scroll of the history of these ninjas on fire, and in the funniest moment of the scene, and tries to make himself disappear. Sheridan’s character, Sally Jones, closes her eyes and counts to ten as Haru runs around looking for a place to hide. In the end, he decides to jump through a rice paper curtain, tearing it apart, and then walks around to appear at another door. It’s pretty hilarious. The movie has Haru follow this mysterious man who Jones is seeing, and when the man kills somebody, Haru is on a raft underneath the docks. The dead body falls into his raft, and Haru is spotted with it and suddenly he becomes police suspect number one. In order to get away from all of the heat around him, and also to help sally Jones out, Haru goes to Beverly Hills. That’s where Jones and this man are from and Haru goes there after them. This now becomes a fish out of water movie, with Haru in a new land, adjusting to new ways. Gobei, sent by their master to watch over Haru, follows him there. Gobei objects to the mission, but is forced to go anyway, and he spends the rest of the movie in various hiding spots or disguises, staying out of Haru’s sight, yet helping him along the way. Many of the disguises are fun, and so are the ways that these two narrowly avoid each other. And sometimes we get moments where Haru accidently throws something off into the distance and it ends up hitting Gobei, or something like that. It’s simple stuff, but it’s always fun. Speaking of disguises, Haru finds himself taking on a couple as well, and these are on par with everything else in the movie. Somewhat silly, but definitely pretty funny. He goes to a Japanese restaurant where the chefs flip the food on a grill right in front of you, and Haru poses as one of the chefs. That means he has to do all of the tricks that they do, and you can imagine how that turns out. Another great disguise has him knocking out a dirty insurance man and then posing as him for the bad guys, making tons of ridiculous jokes non-stop. He’s basically doing one of his over the top Saturday Night Live characters here, but what’s equally funny to the disguise is the way Haru keeps trying to knock the guy out and not being successful. Farley’s Saturday Night Live buddy Chris Rock is also in the picture, playing a bellhop, and it’s nice to have a familiar face helping out. One thing admirable about all of Chris Farley’s movies was that he got support from his friends. I always considered this movie the third in his cannon of three (I don’t count that Mathew Perry, Lewis and Clark movie because it looked terrible and I never saw it.) But Farley’s other two movies, Tommy Boy and black sheep were both with David spade at his side. And here, in Beverly Hills Ninja, he’s got Chris Rock. The man certainly kept good company. Beverly Hills Ninja is a very funny movie. The premise is certainly simple and even clichéd, but this movie is not about plot. It’s about humor. Chris Farley as a ninja is a hilarious concept and there are just so many fun ideas for scenes that end up going along with it. Tommy Boy and black sheep were both fun, but they were also both cemented a little too much in the real world of either business or politics. 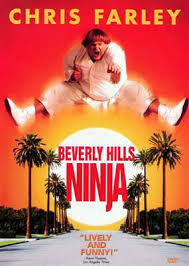 Beverly Hills Ninja, on the other hand, is just pure fun. It’s the movie that gets a little fantastical and it’s the movie that supplies Farley with a mystery, disguises, and plenty of action. It’s not the smartest movie in the world, but it is certainly very funny.